The All-in-Wonder (also abbreviated to AIW) was a combination graphics card/TV tuner card designed by ATI Technologies. It was introduced on November 11, 1996. 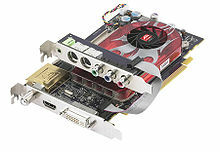 ATI had previously used the Wonder trademark on other graphics cards, however, they were not full TV/graphics combo cards (EGA Wonder, VGA Wonder, Graphics Wonder). ATI also made other TV oriented cards that use the word Wonder (TV Wonder, HDTV Wonder, DV Wonder), and remote control (Remote Wonder). The All-in-Wonder line debuted with the Rage chipset series. The cards were available in two forms, built by third-party manufacturers (marked as "Powered by ATI") as well as by ATI itself ("Built by ATI"). Each of the All-in-Wonder Radeon cards is based on a Radeon chipset with extra features incorporated onto the board. AIW cards run at lower clock speeds (two exceptions are the AIW 9600XT/AIW X800XT faster/same speed) than their conventional counterparts to reduce heat and power consumption. In June 2008, AMD revived the product line with an HD model. The cards use a variety of specialised ports along the side to provide output to televisions, with the retail version provided with composite ports and the ability to output to component. Later products also comes with a Remote Wonder remote control and a USB RF receiver to receive radio frequency signals from the remote. Some variants of the All-in-Wonder included FM radio tuning as well. Some analog-based tuners were bundled with Gemstar's Guide Plus+ electronic program guide for TV listings, while digital-based tuners used TitanTV instead. The AIW card drivers are based on ATI's Catalyst drivers with additional T200 unified stream drivers. Currently, the only operating systems fully supporting TV capture with these cards are Microsoft Windows XP, 2000, 98, and 95. Display drivers work on Linux, and TV capture is supported on some cards with the GATOS project. Radeon 9600 Analog No AGP 2006 ? ^ "ATI's All-in-Wonder brings the seven wonders of graphics acceleration to one mainstream-priced board" (Press release). ATI Technologies. 1996-11-11. Archived from the original on 2008-02-08. Retrieved 2007-11-10. ^ "Investor Relations - ATI Archived News Releases". Archived from the original on 2008-02-08. Retrieved 2007-11-11. ^ "All-in-Wonder X1900". Archived from the original on 2008-02-08. Retrieved 2007-08-30. ^ "All-in-Wonder X1800 XL". Archived from the original on 2007-10-16. Retrieved 2007-08-30. ^ "All-in-Wonder 2006 PCI Express". Archived from the original on 2008-02-08. Retrieved 2007-08-30. ^ "All-in-Wonder X800 XT". Archived from the original on 2008-02-08. Retrieved 2007-08-30. ^ "All-in-Wonder X600 PRO - Overview". Archived from the original on 2008-02-08. Retrieved 2007-08-30. ^ "All-in-Wonder 9800 PRO". Archived from the original on 2008-02-08. Retrieved 2007-08-30. ^ "All-in-Wonder 9700". Archived from the original on 2008-02-08. Retrieved 2007-08-30. ^ "All-in-Wonder 9700 PRO". Archived from the original on 2008-02-08. Retrieved 2007-08-30. ^ "All-in-Wonder 9600 XT". Archived from the original on 2008-02-08. Retrieved 2007-08-30. ^ "All-in-Wonder 9600 PRO". Archived from the original on 2008-02-08. Retrieved 2007-08-30. ^ "All-in-Wonder 9600". Archived from the original on 2008-02-08. Retrieved 2007-08-30. ^ "All-In-Wonder 2006 Edition". Archived from the original on 2008-02-08. Retrieved 2007-08-30. ^ "All-in-Wonder 9000 PRO". Archived from the original on 2008-02-08. Retrieved 2007-08-30. ^ "All-in-Wonder Radeon 8500". Archived from the original on 2008-02-08. Retrieved 2007-08-30. ^ "All-in-Wonder Radeon 8500DV". Archived from the original on 2007-11-01. Retrieved 2007-08-30. ^ "All-in-Wonder Radeon 7500". Archived from the original on 2008-02-08. Retrieved 2007-08-30. ^ "All-in-Wonder VE". Archived from the original on 2008-02-08. Retrieved 2007-08-30. ^ "All-in-Wonder Radeon". Archived from the original on 2008-02-08. Retrieved 2007-08-30. ^ "All-in-Wonder 128". Archived from the original on 2008-01-17. Retrieved 2007-08-30. ^ "All-in-Wonder PRO". Archived from the original on 2008-02-08. Retrieved 2007-08-30. ^ "All-in-Wonder". Archived from the original on 2008-02-08. Retrieved 2007-08-30. This page was last edited on 15 November 2018, at 05:48 (UTC).